What’s Clinton Inc The Movie About? Bill and Hillary Clinton- whatever side of the political isle one is on, we can all agree that this couple certainly may be referred to as a power couple. A movie documentary that provides it’s audience with the story of Bill and Hillary’s past and present as individuals, their political alliance, business partnership, and marriage, with commentary and observations woven throughout the movie from various esteemed professionals would make for an interesting movie indeed. Clinton Inc The Movie, provides for this very experience for the audience of viewers. The Clinton’s political alliance remains, even though they have experienced much reported rocky roads throughout their marriage in marriage and politically. Their marriage has remained, through much publicly observed marital trauma (e.g., repeated cases of infidelity- and in the public eye). They are what may be deemed as a business, a partnership, in essence; a business partnership, and a powerful business partnership at that. A brand? AKA Clinton Inc. Most certainly. Clinton Inc The Movie is a documentary produced by Doug Sain who is best known as the producer of ‘2016 Obama’s America’ and based on author Daniel Halper’s New York Times best selling book. The writer/director for Clinton Inc The Movie is Bill Baber. Clinton Inc The Movie presents the true story of an American dynasty. To learn more about Clinton Inc The Movie, I invite you to check out the official trailer: Clinton Inc The Movie. The Clinton’s are not the first marital couple to navigate challenging and rocky waters. Nor will they be the last. In my work with couples as a Licensed Marriage and Family Therapist, I will share with you that it is not uncommon for couples to report feeling like their particular challenges, their pain, their trauma, is insurmountable, and thus can never be worked through. I share with my couple clientele that when married long enough, it’s not whether they will experience challenges. Rather, know they will. Although to date I have not had the opportunity to meet the Clinton’s, like many of you reading this article none of us can know with certainty what goes on behind closed doors. With that said, I, just like many of you, have observed through the years their journey that has been exposed to the public. As such, through the lens of a Marriage Therapist to have had the opportunity to share my observations and commentary throughout Clinton Inc The Movie, is truly something I am proud to have participated in. How each individual within the couple unit and the couple as a whole sees, processes, understands and thus attends to the challenges, the pain, and the trauma they experience during their couple journey affects the overall experience and the outcome of their marital journey. In essence, the lens in which each individual within the couple unit views the challenges that they experience as individuals and as a couple unit, has everything to do with their reaction to those challenges, how they cope and respond to those very challenges, their emotions, thoughts and thus the actions or in-actions, and the communication interactions they will have with others and between themselves about those very challenges. Additionally, the very lens one has in adulthood is significantly influenced by one’s life experiences (e.g., childhood; specifically the messages one received from one’s parents during childhood either through observations or words stated – has a genuine and profound impact). This notion is just but one of the many interesting concepts explored in this documentary: Clinton Inc The Movie. Of course, as a Marriage and Family Therapist this particular topic is of such interest to me. 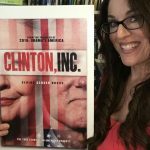 I feel quite privileged and honored to have participated in Clinton Inc The Movie, and to have provided commentary throughout this documentary. It is extremely interesting to hear the observations and comments of the varied professionals who also star in this movie, as we each have our own lens, which is what makes this movie both informative and stimulating for the viewer, in my humble opinion. The Clinton’s – are they a business? Oh yes. Are they a marriage? Indeed. Are they a partnership? Most certainly. Are they a dynasty? Yup. The Clinton’s are married, they are business partners and their business is politics. Each marriage holds it’s own experiences and it’s own journey. Whatever side of the political isle you are on, one thing we can all agree on; this is a couple that most certainly has gone through much as individuals and as a couple, and despite the hurt that has been reported between and within this couple, they most certainly are: ‘Clinton Inc.’ Whether that is good or bad for America – that’s left to your own observation and thus interpretation. Don’t miss this interesting, informative, and professionally pieced together powerful documentary from start to finish! Coming to theaters September 30th 2016. Next post: Addicted To Your Phone?